Each truck and big machine in these enticing rhyming poems is different — and little readers are invited to find a vehicle that’s like them. 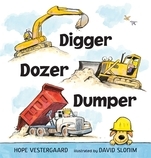 32 / 9 13/16" x 10 1/4"
Hope Vestergaard, a former early childhood teacher, is the author of several books for children. She lives with her husband and two sons, as well as cows, horses, pigs, and dogs, on a small farm outside of Ann Arbor, Michigan. David Slonim is an award-winning illustrator of many children’s books, including The Deer Watch by Pat Lowery Collins. He lives with his wife, four kids, and a dog named Maggie in Indiana.